Roman debased silver coin: Denarius of Faustina I, dating 131-161AD, Reece period 7. Reverse type unclear. Minted in Rome. Die axis 6 o'clock. These coins were recovered during the 1970's. Essex County Council conducted an archaeological excavation of the area throughout the 1970's, however it is unknown the finder was working with the excavators or if these coins were retrieved by another means. The area was developed as a housing estate. 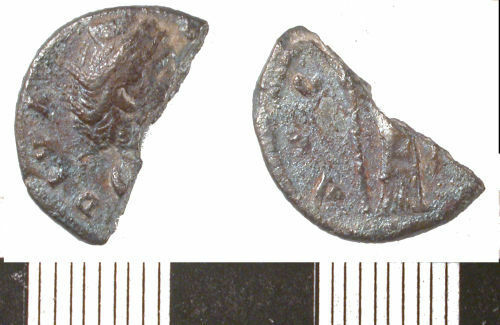 The coins were passed to the Wickford (?Archaeological) Society, and subsequently passed to the Billericay Archaeological and Historical Society. The notes that accompanied the coins (dated 4/10/1978) states that "There is no doubt that this is not the complete collection. The silver denarius of Hadrian and the Cunobelin coins are not included for example". The coins are numbered 1-245, however only numbers 112-245 are present in this collection. It is unclear whether the missing coins have been misplaced, or sold at an earlier date. Roman copper alloy coin: radiate of uncertain emperor. Reverse type unclear. Mint unknown. Die axis 6 o'clock.